This best electronic drum pad review has been on my mind for a really long time. What held me back was my failure to understand what electronic drum pads are good for. I always thought: why go for an electronic drum pad when I can have a big, shiny new electronic drum set? But one day a student of mine made me realize that it can be great to have super compact electronic drum kit (which is what electric drum pads are). Or not to shell out hundreds of dollars for an e-kit – and then spend some more on headphones or an electronic drum amp in order to hear what that drum kit has to offer. Electronic drum pads, by contrast, will enable you to drum away right out of the box at the fraction of a price of an electronic drum set. Electronic Drum Pad vs. Sample Pad For Drummers – What Are You Really Looking For? What Makes the Best Electronic Drum Pad? Note that there is a difference between an “electronic or electric drum pad” (left image below) and a “sample pad for drummers” (right). The difference is this: electronic drum pads consists of pads and speakers, so they can be used instead of a drum kit; sample pads are used as an addition to a drum set. You can use sample pads with an acoustic kit to expand its sound range. Or you can use them with an electronic drum kit in order to add loops and effects like Issah Contractor demonstrates here. So please be aware that this best electronic drum pad review will not deal with sample pads for drummers. 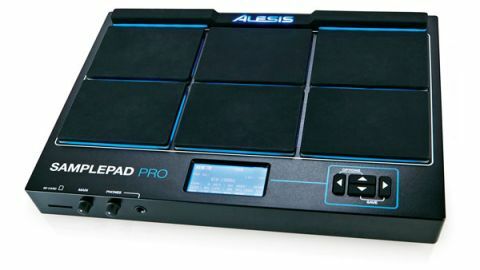 While I’m in the process of writing up a review of those, you can check out my best sample pad for drummers – the Alesis SamplePad Pro – here. Now, when switching to a real drum kit you will have to adapt slightly in any case, since the position of the pads will be different. But the transition will become extra difficult if you’ve never had, say, a ride cymbal pad at your disposal before. Playing along to your favorite music can provide tremendous motivation. And for that to work, you need to be able to plug your smartphone or mp3 device into the electronic drum pad. A 1.4″ input will enable you to do so, so watch out for it. You can virtually silence your kit to third parties (your family, your neighbors) by connecting them to headphones. To people outside those headphones, your playing will then only be as loud as hitting the pages of an open book with a stick. Note: a USB or MIDI input is only required if you want to record AND later modify the grooves you play on your electronic drum kit. For that you’ll have to connect your pad to your PC through precisely the USB or MIDI output. Some pads will have hundreds of those sounds on board and some will only come with a handful. Obviously, more sounds give you more creative flexibility, since you can change the sound of the kits inside the pad – or create your own kits from scratch. Electronic drum pads let you assign the sounds on a pad-to-pad basis – or they only give you the option to change the sound of all (4, 7, 9) pads as a whole. The first option provides you much more room for customization and fine tuning of your sound. It’s also the way that electronic drum kits work and therefore preferable. Sound quality certainly is an important feature since you or your child won’t likely play the electric drum pad a lot if it sounds like crap. Yet, sound is a very subjective matter, so please don’t give too much weight to my opinions. Rather, check out the videos I’ve provided and decide yourself. 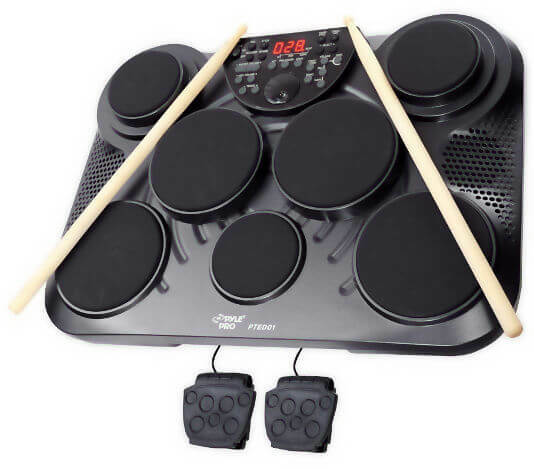 A suite of drumming and learning tools (metronome, recording, groove trainer) along with a competitive price point and the largest range of sounds an preset kits, make this – in my view – the perfect electronic drum pad for beginners. Some people have reported problems with the MIDI connection to their PC in that it either doesn’t work or the signal is only very quiet. Since I didn’t have a problem in Garageband, I suspect this issue occurs with less popular music software such as Sony Acid etc. The Pyle Pro’s control panel has lots of buttons, some of them with self-explanatory labels – but some fairly crpytic (e.g. “pan”). So it might be hard for you to control the Pyle Pro without consulting the manual first. 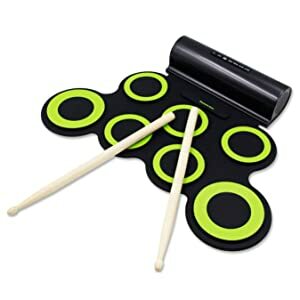 If you’re dead set on using your electronic drum pad as a MIDI device, I’d say look at another one because it might not connect to your computer. But if you’re looking tio start drumming at very low cost, in small spaces and without buying additional equipment, I fully recommend the Pyle Pro tabletop pad. Another option that I wouldn’t recommend if you’re dead set on using an electronic drum pad as a MIDI device. 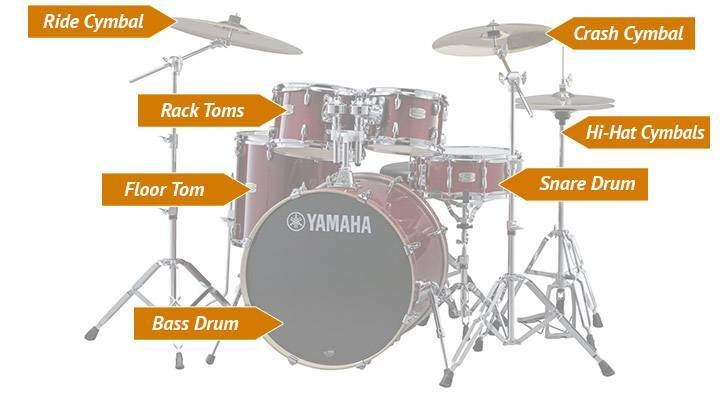 Instead, the Yamaha DD65 is a very intuitive-to-control drum pad with the widest possible choice of pads to play even highly orchestrated musical styles such as metal. You will have to reach deeper into your pocket for the Yamaha DD65, but for the purposes just explained I think it’s well worth the money. The Alesis CompactKit 4 is equipped with a “game” and a “coach” function that will play and show rhythms on the screen, prompt your child to imitate them – and then score your playing. I think that learning by ear is one of the most useful methods of starting to learn the drums – and since the CompactKit 4 moreover embedds this into a game. That’s an amazing learning tool! Buttons on the control panel are kept to a minimum, so you’re child will probably be able to control this right away. And there’s also a large LCD screen for clarification. None of the below electronic drum pads for kids have this. Comes with 80 different sounds that you can assign to each drum pad individually – so your child can create his / her own drum set sounds. Both other children’s drum pads below (Paxcess and RockJam) can only change the sound of the all pads as a whole. 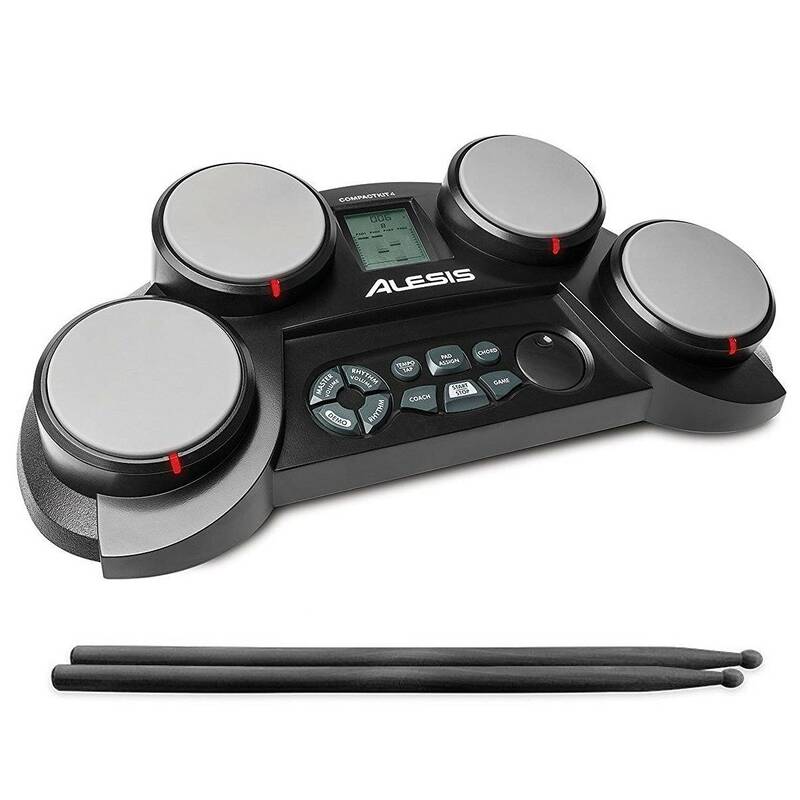 The Alesis CompactKit 4 is an electronic drum pad for children, but I’m no recommending it under any circumstances. 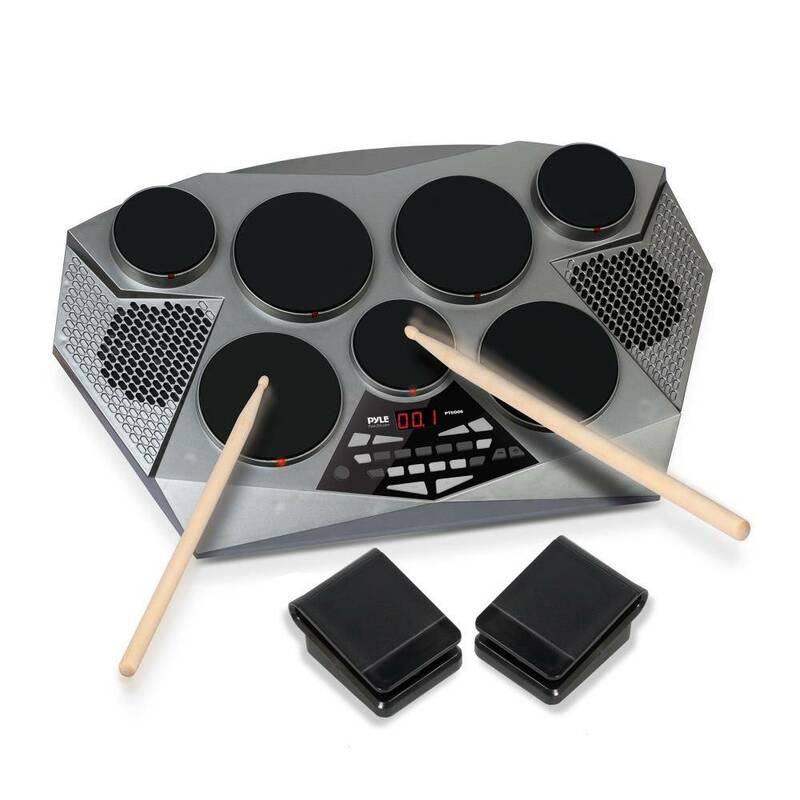 That is because it lacks 2 essential learnings tools that the other two children’s electronic drum pads below have – the ability to record your playing and a metronome. At the same time, the Alesis CompactKit 4 is also more expensive. Now, the price tag can be justified, but only if child absolutely needs to learn the drums in the context of games. Then the “coach” and “game” functions along with the large display and intuitive controls of the Alesis CompactKit do much better than the RockJam and Paxcess below. You can use this as a MIDI trigger. That means, you can connect it to your PC and modify the sounds through a music software such as Reaper. Or you can connect it to your Playstation or Xbox and use the RockJam to play Rock Band. Metronome on board. That’s one of the most important learning tools for a beginning drummer and these things do cost something when bought as standalone versions. Setup of the pads not transferable to real drum kits. This is because drummers normally play the hihat with their right hand / stick and the snare with their left hand by crossing the hihat stick over the snare drum one. On a drum kit this works out well, because the hihat is situated a good few inches above the snare drum. On the Paxcess kit, however, both are at the same level, so crossing the sticks is impossible. Paxcess tried to compensate this by creating a button with which you can allocate the snare to the left-hand pad and the hihat to the one in front of you. This way you’d use the same hands for the hihat and snare that you would use on an acoustic kit. Still, you’d have to learn the cross-sticking – which is certainly possible but not ideal. The Paxcess roll up electronic drum pad is explicitly geared towards children and I wouldn’t want to recommend this to any adult. After all, this is a toy through and through, yet starting into drumming in a playful way is good thing in terms of motivation and learning. So I would recommend it wholeheartedly if there wasn’t the issue with the cross-sticking. This will present at least a nuisance once your child changes to a real drum kit, so I think he / she would be better off with the RockJam roll up pad below. The one use case in which the Paxcess does make sense to me is when you’re looking to operate an electronic drum pad on battery for most of the time. Very small (probably fits most handbags) and quick to store away. Simply wrap the pad surface around the speaker and you’re good to go. Built-in recorder allows you to listen to what you’ve played. This is very useful for practicing as a beginning drummer. 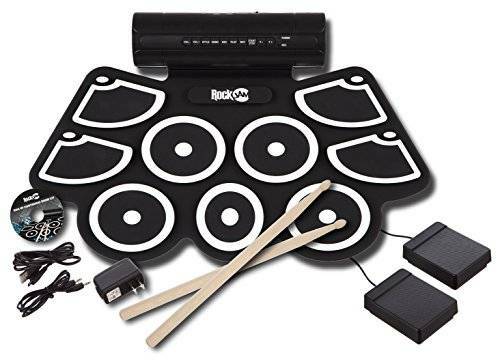 The RockJam rollup electronic drum kit comes in 2 versions, one with and without built-in speakers. Since even with speakers they are very affordable I recommend you go with this version. Yet, if you buy the version without speakers, make sure they have a mini stereo jack (1.4″). For what it is, I’ve nothing to complain about the RockJam Roll Up Drum Pad. That means, it does well what it’s supposed to do. But: I can only recommend this if you’re dipping your toes into drumming for the first time. In case you’ve owned or played an electronic or acoustic drum kit before, it’s likely that the Rock Jam will disappoint you. For in comparison to real drum kits, it comes across rather toyish. However, if you’re not only wanting to try drumming without spending too much initially and if you also want to do so on the go – the Rock Jam roll up drum pad has my approval. Also, the Rock Jam is a good first drum tool for kids – because there’s always the risk that he / she will lose interest in drumming. Having an expensive drum set sitting in the basement doesn’t help in those situations. I appreciate you made it all through the review. But I’m also sure there might be a question lingering in your mind. Or a comment on my best electronic drum pad reviews. Or some feedback. I’m grateful for any of that, so please do let me know in the comments below. I will get back to you very quickly – guaranteed!